Climate science may be fundamentally changing our view of how humans settled New Zealand and of how pre-European Māori culture changed. Australian National University Emeritus Professor Atholl Anderson FRSNZ tells us how science as a whole is an important part of Tangata Whenua: An Illustrated History, which charts Māori history from ancient origins to the 21st century. Co-authored with Aroha Harris and the late Judith Binney FRSNZ, the landmark publication is the winner of the 2015 Royal Society of New Zealand Science Book Prize. Do you think that weather – or climate science – has been underrated as a force of history? I think the climate was particularly important in several respects in pre-European New Zealand – the first is that changing wind patterns make a plausible case for how people could have reached New Zealand. Opinions vary about the sailing capabilities of ancient Polynesian canoes, but sailing into the prevailing westerly winds of the temperate zone was at least extremely difficult. However, there was about 200 years covering the colonisation period when the prevailing winds came from the east, making colonisation passages to the southwest from tropical East Polynesia relatively easy. Then from about AD 1300-1800 the prevailing south-westerlies kicked back in again and we don’t see any evidence of another colonisation period of people moving to New Zealand. How much has science already changed our view of pre-European Māori history? Science actually plays an important part of the book as a whole, including more recent Māori history. It is used least of all in the 19th century, perhaps, but in the 20th century quite a lot of scientific material from economics and social science is used to cover issues like health, employment and migration. But of course the main area in which science is involved is the first section of Tangata Whenua, looking at pre-European history and archaeology. Since about 1950, radiocarbon dating has made a huge difference to thinking about when human settlement began in New Zealand, now indicating that it was around AD 1280-1300. Other approaches have been through physics and chemistry to define source locations and movement of obsidian and other lithic resources used by Māori, and through palaeoecological research to describe anthropogenic environmental change. It’s written in Tangata Whenua that it’s the volatility of this time that is striking, rather than the brevity. Why is that? When you look at those 500 years of pre-European Māori existence in New Zealand, an awful lot happens. The human population grows from a few hundred to 100,000. We lose all of the terrestrial megafauna: nine species of moa, Aptornis, goose, eagle etc. A great many invertebrates would have been lost. The forest cover is reduced by 50 per cent. Then there’s all the cultural change in switching from what had been a very mobile existence with wide accessibility across the landscape to increasing territoriality, restrictions on access to distant resources, and a surge in warfare from about AD 1500 which results in an explosion in the number of pa sites – there are at least 7000 of these recorded. These changes also involved a new phase of migration, this time within New Zealand, which substantially altered the social landscape. Did climate play a role in that change? Yes, about AD 1500 there was a quite sudden drop in mean annual temperatures of about 1.5 degrees Celsius, and that’s significant in terms of agriculture, notably in breaching the minimum frost-free period required to grow kumara. In the 1300s and 1400s people were able to grow kumara as far south as Banks Peninsula. But that was the absolute margin. Growth was entirely coastal and often probably unreliable in the long-term from Banks Peninsula up to the southern North Island. A shift of 1.5 degrees moves the absolute boundary, and the area of marginal cultivation, northwards by about 150-200km, which means that reliance upon agriculture was probably not possible south of about Taranaki and Hawkes Bay. At the same time you’ve got a rapidly rising population, and these things together almost certainly were instrumental in increasing territoriality, warfare and internal migration. You’ve said some sections of Tangata Whenua had to be rewritten repeatedly, because the science is changing so fast. What is still changing? Genetics come to mind immediately; the study of human population origins is in a continual state of change. Where Polynesians came from has been debated for a number of decades, and the fundamentals of that aren’t going to change – we know that Polynesians came primarily from South East and East Asia in general. But the details of Polynesian origins are changing. Around 10-15 years ago it was said that Māori were from Taiwan. While there is some evidence for that there are equally connections with people from Indonesia and it is now apparent that there was a significant contribution from older populations in Melanesia. The genetics of dogs, rats, pigs and chickens carried by Oceanic peoples also indicate multiple origins. There is some evidence, as well, that a few South American Indians, who had very good sailing technology, did get to Easter Island, although Polynesians were there first. 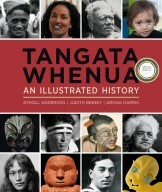 Tangata Whenua: An Illustrated History is the winner of the 2015 Royal Society of New Zealand Science Book Prize. Interviews with the other four finalists can be found in previous IAQs blogs.